SHOPIAN: Labour department today organised an awareness program for unorganised workers here at Arhama. Assistant Labour Commissioner and other officers and officials and hundreds of construction workers participated in the event. Assistant Labour Commissioner Syed Abid Hussain, enlightened the construction and other workers in detail about various welfare schemes and the labour laws, meant for their safety and overall upliftment. The construction workers were educated about various welfare schemes being operationalised by the construction and others workers welfare board for their benefits. On the spot renewal and registration was done by the department besides prospective construction workers were instructed to follow several do's & don'ts while applying for registration in online mode so as to minimise the risks of errors and delay. Awareness was also given regarding recently launched PMSYM pension scheme for unorganised workers. 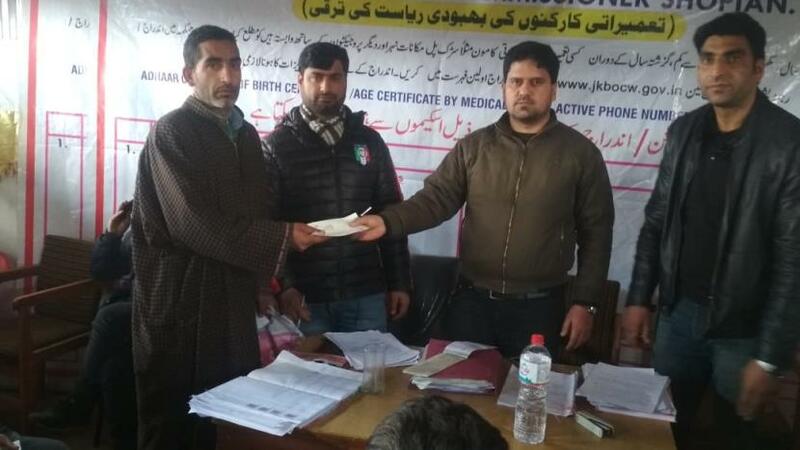 Later financial assistance under death, injury and illness and professional education assistance schemes amounting to Rs 6.26 lakh was disbursed among 17 eligible beneficiaries.